I LOVE FALL!!! I own every bit of my basic tendencies in the fall. Sweatshirts, boots, pumpkin spice lattes, crockpots, football…you name it I love it. When September 23rd finally rolled around I was ready to start all kinds of fun fall activities with the girls! I resisted my urge to go to Pumpkin-Land at a nearby orchard (I have to save a few things for October), but figured there were other fun fall activities on the premises. Our last trip there was to go peach picking (check out our peach sorbet recipe here), and it was such a hit that we returned to for more overpriced fruit picking fun! This time we brought Daddy along, and went for the apples! As expected, Layla was so proud of herself that she talked about apples non stop for days after. 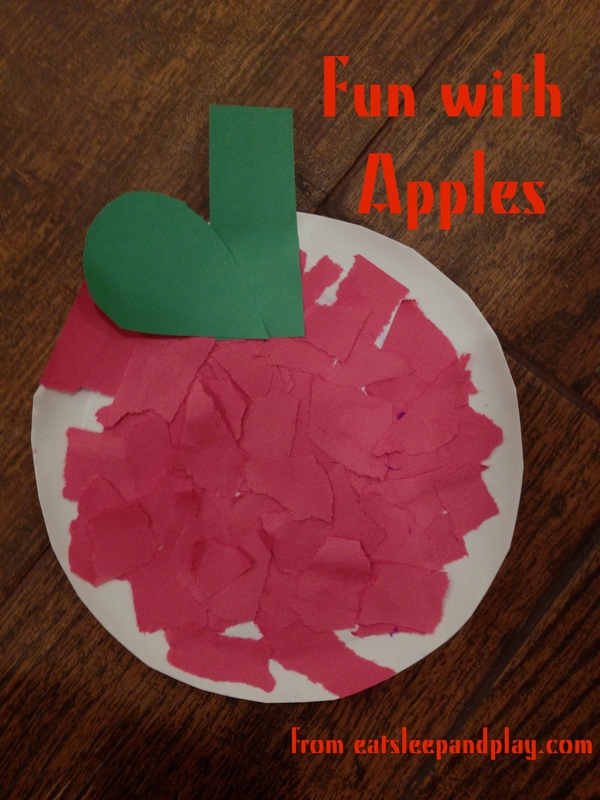 I used this as my in for some fun fall apple activities! Directions: To make our apple craft we began by ripping up pieces of red construction paper. Get your kids in on this, their helping you out, practicing fine motor skills, and just love the opportunity to tear things up without getting in trouble! Once we had about a cup of red paper pieces, I used our glue stick to put glue on about 1/4 of the plate. 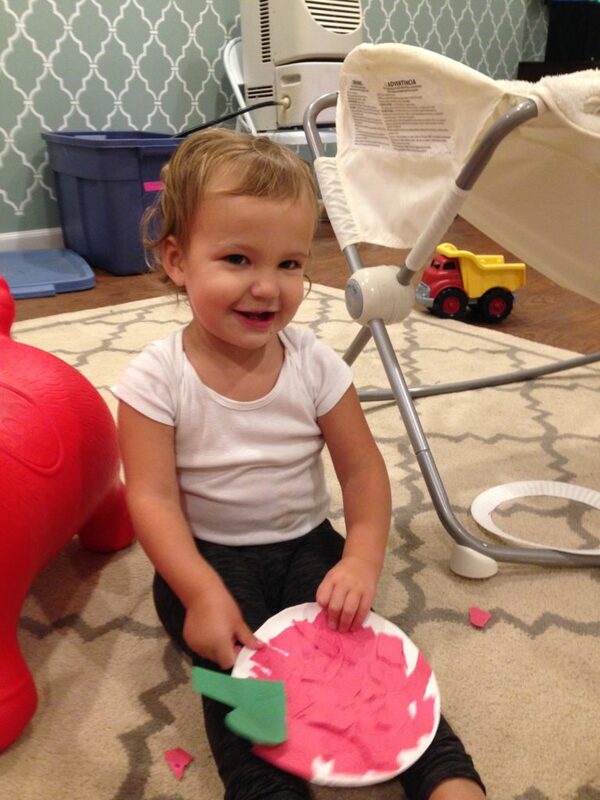 *I recommend using the purple glue sticks with little ones because they can see exactly where the glue is while they’re working, but than it dries clear! 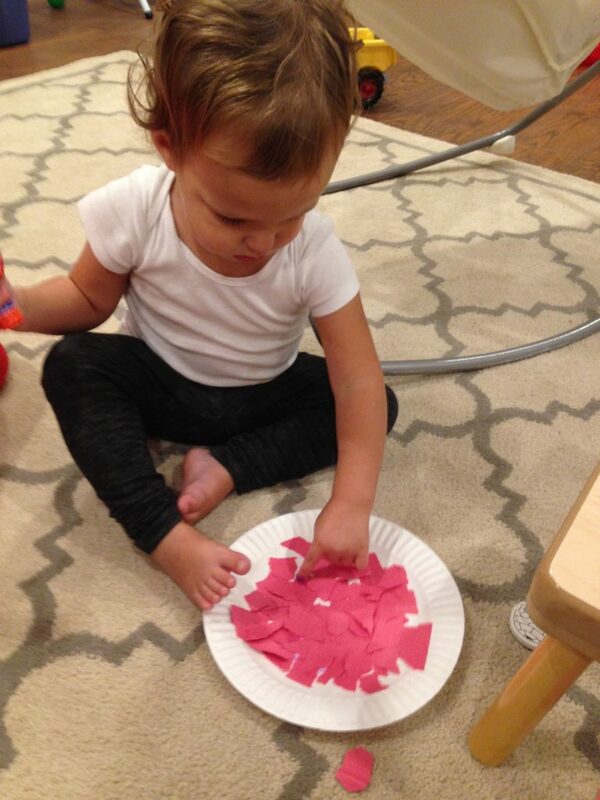 Once the glue was down Layla took pieces of the red paper and pressed them into the plate. We repeated this until the plate was covered. I occasionally let her use the glue stick- which ALWAYS ends with her digging her finger into it. Finally, we added the stem and leaf! 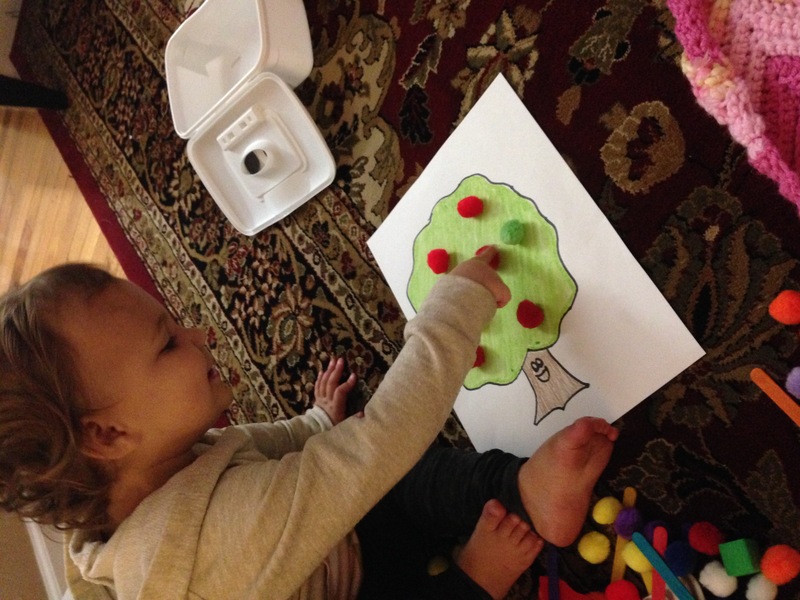 Directions: Toss a few pom poms onto your tree drawing and tell your child that these represent apples on the tree. Once their in place the kids can “pick” the apples off the tree and count as they go. You could even use this for addition and subtraction practice with older children. 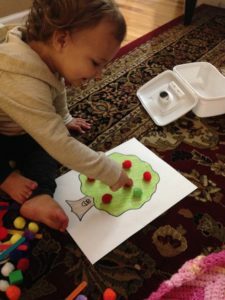 Layla ended up loving this activity, and I was so excited when I was cooking dinner one night to hear her in the living room saying “oneeee…twoooo…threeee”. I peaked around the corner to see that she had taken this out, and was working all by herself!